Some horror movies work your nerves and leave you frightened, but at least you feel justified in your fear. Other movies — well, let's just say you should feel embarrassed that they scare you. And here they are. Prepare to be ashamed! You know you're not going to get eaten by a shark. I know I'm not going to get eaten by a shark. Steven Spielberg knows he's not going to get eaten by a shark. The general fear of getting eaten by a shark was pretty much invented by this movie. And yet we're still scared. Shame on us. The original movie is legitimately scary. Its scaled-down horror and slow build of suspense, as well as its everyday setting, makes it more frightening, late at night, than elaborate horror movies. In 2007. It's now 2013, and we're probably going to see Paranormal Activity 10 by the time the decade is over. This is an example of a movie whose horror has been utterly destroyed by its awful sequels. If you can still get scared after all that elaborate mythology and increasingly silly methods of catching the demon, you should feel just a little bit bad about yourself. There are two different parts of Don't Be Afraid of the Dark. There's the part that has insane goblin voices that laugh in the darkness, slowly manipulate the heroine until her own friends leave her helpless, and then drag her off to an undetermined fate. And then there's the third act with the little guys who look like someone put an apple-face doll in a suit. Once you see the ending, you'll feel like a dork (and not in a good way) for covering your eyes during the first half. Citadel is a well-crafted film that keeps you guessing. A cheerful young man witnesses an attack on his pregnant wife by hoodies. He develops crippling agoraphobia. He's also reduced to poverty. Between these two factors, the world becomes a hellscape, with zombielike civil servants who regard his terror with no compassion, black-outs and bus stoppages that leave him vulnerable, and random frightening events that could be attacks or could be bad luck with no safety net. The man's fear infects the watcher. Then the secret of the hoodies is revealed - they're mutants who sense fear, are taking over the world, and their housing project needs to be blown up. This dumb reveal, and the way the characters who stress compassion for the young and poor are brutally murderized, turns the film into a facepalm. But those scenes of blackouts and people staring through your window are still scary. It doesn't matter how cheesy the rest of the movie is. It really doesn't. All you need is the introduction to the monster. Watch the first forty-five seconds of this clip and it won't make a difference how many fake spiders they wave around in the finale. You're still (shamefacedly) scared. And you'll never go to the circus again. I'm not saying it scares you all the time. I'm just willing to bet that, after watching this movie, you spent a little time looking over the plan of your house and wondering if you could hop from one piece of furniture to the next without the graboids getting you. Ha! Remember being scared by Poltergeist? That's fair. Poltergeist is a good horror film that makes the environment that surrounds us every day vaguely threatening. Plus they did that whole 'based on a true story' media blitz at the time of its release. If that didn't make you feel a little creeped out when you saw static on your tv screen, you weren't paying attention during the movie. The Entity was Poltergeists' sleazy cousin, that was all about watching a ghost sexually assault a woman for two hours in a vaguely poltergeist-ish way. It's embarrassing to have seen it at all. And yet the two movies layer on each other and morph into this big creepy mass that keeps you from feeling safe in your house even though one of those movies clearly didn't earn your fear. The Blair Witch Project isn't really a bad movie. In fact it's so good that it paved the way for a lot of other movies. After it came out, other movies allowed their monster mythology to be vague, instead of explaining every detail. 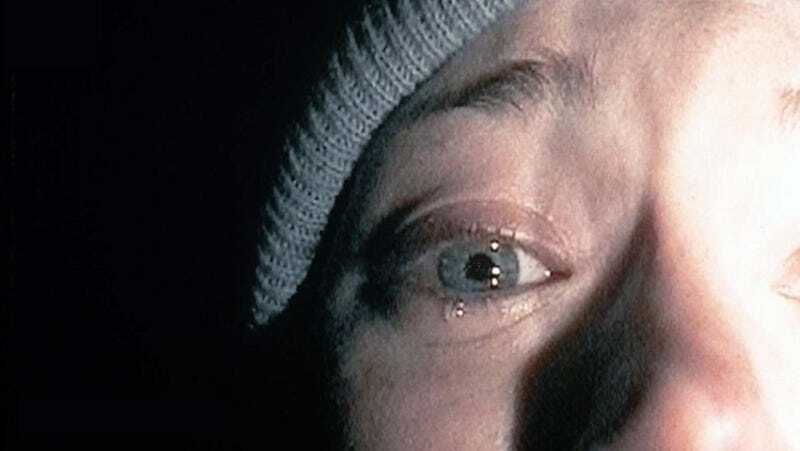 Other movies used the found footage technique to give people a sense of immediacy during the experience and reality after it. Other movies threw out the formula that said "the girl lives," in favor of killing everyone and leaving the audience alone with the monster at the end. The problem is, we've had fourteen years of movies doing exactly that. After all these years the Blair Witch should have uncoiled her hairy fingers from our psyche. It should be nineties nostalgia by now. But do we watch it when we're going camping? No. No we don't. Because there is going to be some night when we have to leave the tent to go to the bathroom, and we want to be able to do that instead of cowering in our sleeping bags and holding it in until dawn. Stephen King's notoriously good horror stories make for notoriously bad films. The psychological description that King gives his monsters can't translate to a literal visual image. The Boogeyman, a short story collected in the book Night Shift, makes better films than most because we see so little. A man in a psychiatrist's office describes the deaths of his three children at the hands of a monster called the boogeyman. We don't know whether he's making a veiled confession of his own crimes, whether he feels guilt for repeated instances of crib death, or whether he's stalked by a real demon. Two different short movies have dramatized it, and they're good, right up until the boogeyman is revealed as a guy in make-up and a suit. We shouldn't be scared of that. But, when night falls, we are. We're scared of a monster with a ridiculous name, that no one outside of footie pajamas should be scared of - and it's embarrassing because it mimics the cowardice of the main character. In the most wrenching scene of both the story and the movies the man, terrified by the monster hiding in his house night after night, decides to force his last child to sleep in a room away from him. Although the toddler understands what's happening and begs for help, the man knows that the monster will go for the weaker prey first, and it does. It's the ultimate moral collapse, and when we fear the same monster, we're sharing the man's shame and personal destruction. That's scarier than anything hiding in the dark.